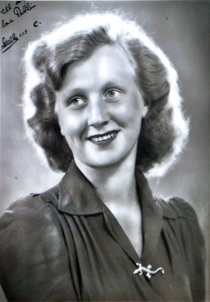 Obituary for Stella (Boller) Leckie | Crandall Funeral Home Inc.
Stella Constance Leckie, 91, passed away on February 6, 2019 at Abbington Senior Citizen Residence. She was the widow of George M. Leckie. They shared 55 years of marriage together. Born in Birmingham, England, the daughter of William and Lillian Boller and graduated high school in Sutton Coldfield, England. Church and the Lutheran Church here in Evanston, Wyoming for many years. She enjoyed doing every craft and there was not a craft she could not master. Bowling, Darts, and Senior Citizen Special Olympics were other skills she mastered. She volunteered for Meals on Wheels and drove the Senior Citizen Bus for many years as well. She will be remembered for her kindness, thoughtfulness of others and her sharp wit. She is survived by her children, Michael G., Terrance M. and Patrick B., 11 grandchildren, and 17 great grandchildren. She was preceded by her husband, George M. Leckie, her daughter Constance M. (Leckie) Solheim, her son Paul F. Leckie, and her grandson Brady Leckie. The funeral service will be held 10:00 am Tuesday, February 12, 2019 at St. Mary Magdalen Catholic Church in Evanston. A Vigil Service with Recitation of the Rosary will be held at 7:00 pm Monday night at Crandall Funeral Home. A visitation will be one hour prior to the service at the church.